Use our Newyes e-writer to keep notes or make drawings in the most stylish way. Pressure-sensitive LCD writing surface makes your writing or drawing appear without any delay, which is exactly like writing on a regular board or notebook. And you will never bother about searching for a pen or pencil again. Write with the included plastic stylus or even by your finger, and erase by a simple touch of the erase button, easy operation and high efficiency. Lightweight and portable design makes it perfect for school, office, home use or other use. Newyes LCD writing tablets are sold to all over the world and stand out in more than 30 countries and regions. Our writing tablet of high quality and satisfactory service win more than 95% five-star praise rate. Shenzen Newyes Technology Co.,LTD was founded in 2012, located in modern international Shenzhen. Newyes Technology Company is a manufacturer which specializes in research, development, manufacturing and marketing smart life electronic products. For the foundation of high-quality raw materials, through precision system and ring upon ring of quality inspection, meticulously create a series of LCD writing tablets. 1. Choking Hazard. With Small Parts, not for children under 3 years old. 2. Please don’t put the product into water. 3. No self-service parts. Please don’t disassembled the product by yourself. 4. Please keep the battery away from children. Please use same type of battery. Please don’t throw batteries to fire or water. Please dispose the batteries according to local regulations. 5. Please avoid using other hard object other than the stylus and your finger nails to write on the surface. If you encounter and dissatisfaction when you are in the shopping process, you can contact our online customer service staffs, or communicate with us by the phone or e-mail. We believe we can give you a satisfactory answer and solution, we will improve in a timely manner, and do better. If you are satisfied with our service and product, please leave us five-star positive feedback. 1. Does this have a usb or a wall charger? 2. Does it have magnets on the back to attach to a refrigerator? 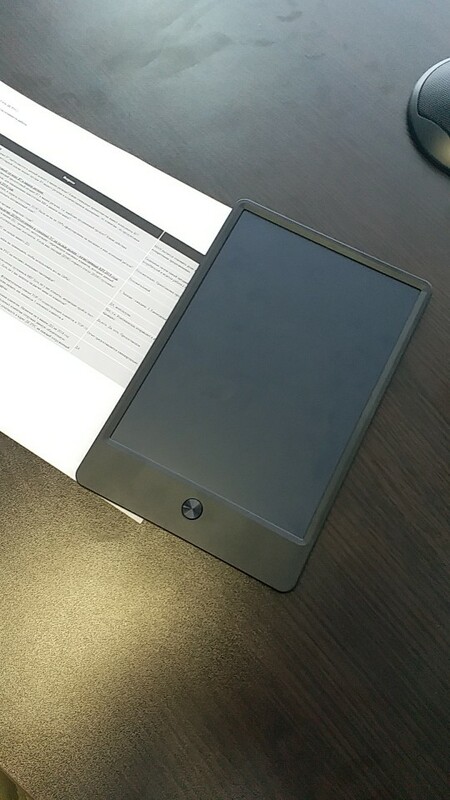 Answer : One sticky-backed magnet is now included with each of these LCD writing tablets. Its about an inch long and 1/4 inch wide. 3. How would you clean the screen? Answer: Just press the button on the above, the screen will be cleaned. One battery can last for about 50000 cleaning times. 4. Is that the same with boogie board? 5. I’d love to see some customer’s pictures of their own devices ! Still on the fence on whether I should get this one or the boogie board? Answer: They are almost identical to boogie board. I have bought two and my grandkids love them. 6. Does this come with a warranty? 7. I intent to use it at the night time/dark room, will I be able to see the writing? Answer: Nope. I’m telling you that it literally feels like one of those old school grey boards from the super market that you write on then peel up the film to erase it. But digital. It is cool enough to spend maybe ten bucks on a that’s pushing it. The brighter the room the better. There’s no glow or illumination. 8. Can I transfer information to a Windows based computer? Answer: Sorry, it can’t transfer to other devices for this LCD writing tablet. 9. Is this tablet rechargeable? How long does the battery last? 10. Does it have place to store the stylus? Answer: Yes, at the top of the board. 11. Is there a protective sleeve you can purchase to go with it? Answer: Yes,there is the protective sleeve in our store, or there is a listing for the writing tablet with the protective sleeve. Очень удобная. Дошла быстро, без повреждений. Приехал быстро. Много пробовал аналогичных – этот прорисовывает хуже всех. Линия тонкая, требуется сильный нажми. Но дизайн и качество изготовления достойное.